Nicole's Needlework: The Riddle is Finished! I decided to be good and get "The Riddle" Finished up. This was such a fun stitch from beginning to end. I didn't get bored once! The only thing that bothered me were the tiny errors throughout the pattern. Nothing major, just enough to be an annoyance. So if you decide to stitch this, watch out for them! The Drawn Thread "The Riddle"
Well, now I think I'll get back to "Finch Song." Or maybe I should be good again and work on "It's Berry Time?" Nah, I think I've been good enough for one day. :) Write soon! Oh my goodness Nicole ... your finish is FANTABULOUS. Just Beautiful. Have fun with Finch Song. It's a beauty!! Gorgeous! As always I am in awe of how fast you stitch :-). Woohoo!!!!!!! Congratulations on a gorgeous finish, Nicole!! YGG! I can't wait to see what you work on next! wonderful finish, Nicole! Your flying needle has brought you another project to completion! It's absolutely gorgeous. Congrats on the finish! The Riddle is so beautiful and is even prettier than what I thought it could be just looking at yours! I will have to watch for the errors. We get our car back on Saturday. I may get to go to my LNS which would be a joy! I acm looking forward to watching your progress on Finch Song too! Looks really good luv the colours!! How pretty! I loved watching your progress on this. How much margin do you usually add to your fabric? Congratulations, this is a beautiful finish! That is lovely. You do such beautiful work. It truely is a work of art. It's beautiful! You stitch so fast!!! I love watching your progresses and finishes. Thanks! This "beast of a piece" is all done! Whew! It looks like so much work all laid out like this, but boy is it gorgeous! I think I like the section with the "kitchen chairs" (or my grandmother's kitchen had them), roosters, keys, and shears best! It is just sooo gorgeous! I'm so tempted to order fibers for it! But I already have too much kitted.... So what? lol! It's so beautiful Nicole, I love it! Congratulations on this finish!!! It is gorgeous!!!!! Very pretty! Congrats on another great finish. congrats on the pretty finish. It's finished and it's lovely! It is a very intriguing piece. I vote for Finch Song! beautiful! i despise errors on patterns, i had to turn away from one project about 1/2 way through bcs the errors seemed to be multiplying. Glad you saw this one through. Your finish is stunning! The chart may not have been perfect, but your stitching certainly is!! And it took you, what, about three hours from start to finish? Beautiful finish, can't wait to see it framed. You should be so proud!! Absolutely stunning! I was at a loss for the Designer until I read it at the bottom of your post. It seems like a different look for The Drawn Thread and I like it. This may be a pattern to add to my stash. I have stitched a lot of her designs and have thoroughly enjoyed every moment...fast and fun! Now I know how you were able to complete it so quickly...there is no helping one's self where this designer is concerned. Enjoy Finch Song! This is absolutely beautiful Nicole! I have enjoyed watching it come together. 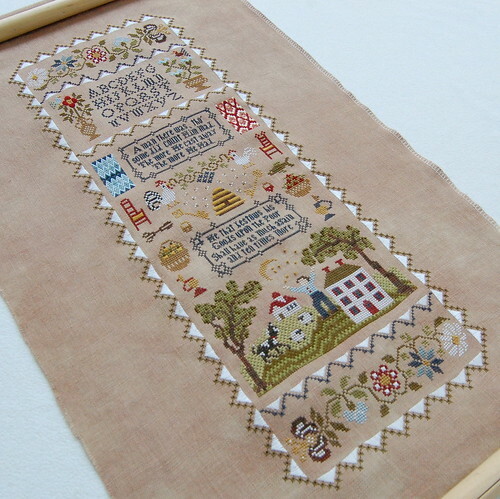 You are a very dedicated stitcher and I always admire at how you get busy with a piece and finish it so quickly. You are truly an inpiration to me and others! That is such a beautiful finish nicole. Congratulations. Congratulations on a Stunning finish! It looks great! What a gorgeous finish. I have never seen this design before and its just so lovely. What a beautiful job you did. Can't wait to see whats next, everything you stitch is just so lovely. The Riddle is very pretty! I still can't imagine what you do to stitch so fast. Maybe it has something to do with focus, which I lack! Beautiful...just beautiful. Love the vibrant colors. Great finish, Nicole. Absolutely beautiful. Congratulations on a wonderful finish. Congratulations on your fabulous finish! Congrats on another BEAUTIFUL finish Nicole!!! It is absolutly beautiful finish, Nicole! That is just gorgeous!!! Beautiful finish!! That is stunning, Nicole! Congratulations on your finish! Nicole, that is just gorgeous! I am getting ready to stitch this one. Are there many errors? Your finish is fantastic!